Check Rates & Availability at Aston Shores At Waikoloa! *** Comfort and Luxury Big Island Style *** A view of the golf course can be as exhilarating as a view of the ocean. 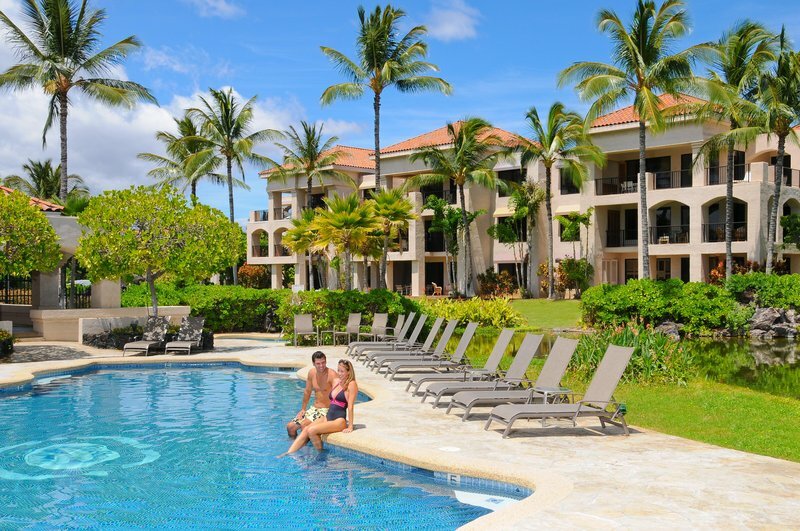 The Aston Shores at Waikoloa is an upscale condo resort in the world-famous Waikoloa Beach Resort area. Located on the sun-drenched Kohala Coast between the Kings and the Beach Golf Courses- all suites and golf villas feature generously-sized lanais- fully equipped kitchens- and spectacular lava fields surrounding the resort. Access to the resort is through a gated entryway and parking is conveniently located just outside each unit. Guests have access to nearby shops- restaurants and activities- miles of neaby hiking trails featuring petroglyphs and remarkable volcanic formations. Golfers will envy our location adjacent to two of Hawaii-s most famous links - the Robert Trent Jones Beach Course and Arnold Palmers Kings Course. Preferential rates and tee times can be arranged for our guests. After the game- unwind in our swimming pool and jet spa- or if golf is not your game- complimentary tennis on our two courts is available- or shopping at the nearby Kings and Queens Shops with an array of one-of-a-kind shops and high-end boutiques. Fine resort dining as well as family-friendly restaurants are all nearby. --- HAWAII-S NON-SMOKING LAW --- In the interest of the good health of all our guests - employees and owners- and in compliance with the State Law Act 295- ALL Aston Hotels and Resorts and condominium units managed by Aston Hotels and Resorts are now designated as Non-Smoking Accommodations effective immediately. A view of the golf course can be as exhilarating as a view of the ocean. Located on the sun-drenched Kohala Coast between the King-s Course and the Beach Golf Courses in Waikoloa Resort- this resort features suites and golf villas with large lanais and full kitchens. Guests have access to nearby shops- restaurants and activities. All suites include a fully equipped kitchen with microwave for guests to enjoy -at home- convenience. Many restaurants are located in the Kings and Queens Shops nearby.